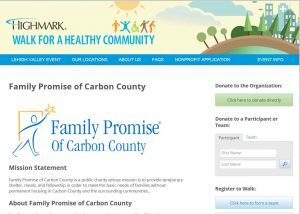 Family Promise of Carbon County will participate in the Highmark 5K being held at DeSales University on Saturday June 3rd. Gather your family, friends, gym buddies and colleagues and register a team to walk. Highmark underwrites the cost of the event so that the money raised can benefit Family Promise and the homeless families we serve together! Our goal is to raise $20,000 for critical homeless shelter services. Form a team of 10 people (or any size). Tell everyone that you are walking to support Family Promise and collect donations. $100. per walker is suggested but any amount over $35 per walker is accepted. You can Register a team, join an existing team existing team or register as an individual. It’s also easy for your friends to support you by making donations online. 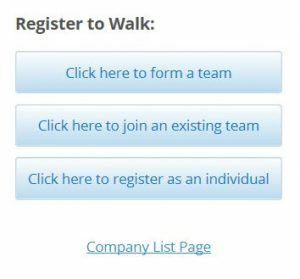 Donors can donate to the organization, to a participant or to a team on the Family Promise landing page on the Walk for a Healthy Community Site.